New Zealand is still the way life used to be! Here you'll find friendly and open people who'll provide you with a genuinely warm welcome. Escape the hustle and bustle of the modern world and enjoy the tranquillity and easy pace of life on the byways. Just you and your motorcycle touring the quiet open road. New Zealand is truly a beautiful country. The scenery will simply take your breath away, especially in the South Island. From amazing geothermal areas, lush rain forest, snow capped mountains and glacier carved fiords, New Zealand has one surprise after another. No matter where you are you'll find the next surprise just around the corner! You'll be greeted by quiet open roads, particularly in the South Island which is the less crowded (and more scenically beautiful) of New Zealand's two main islands. New Zealand's population is approximately 4 million people, with approximately 3.1 million in the North Island and 900,000 in the South Island. 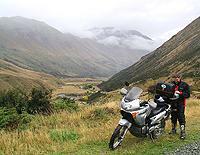 Combined with the uncrowded and unhurried roads, this makes motorcycle touring in New Zealand the ideal motorcycle holiday. New Zealand has approximately 90,000 kilometres (55,000 miles) of roading, both sealed and unsealed. For your safety and comfort we have put together some riding tips which we hope you will find useful. The most important thing to remember when motorcycling in New Zealand is that we drive on the LEFT HAND SIDE of the road. This is the same as in the United Kingdom and Japan. Whilst motorcycling in New Zealand it is compulsory that the rider and pillion passenger wear a safety helmet at all times. This is an important safety requirement. It is also important that you wear appropriate riding gear. This will not only protect you against the elements (wind etc) but also provide you with some added protection in the event of an accident. 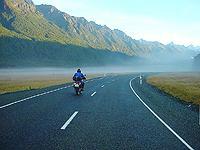 The maximum speed limit for the open road in New Zealand is 100 kilometres/hour (62 miles/hour). Drivers generally travel slightly under the speed limit. Please note that average speeds are lower and it takes longer to travel distances in New Zealand than might be expected. This is due to the hilly and mountainous nature of our countryside. The main highways are normally undivided single lane with traffic in both directions. The roads are undulating and follow the contours of the countryside. 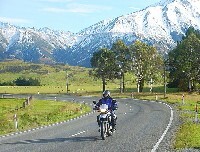 This is what makes motorcycling in New Zealand so enjoyable - no dull and boring straight roads here. But a word of warning - be on the lookout for oncoming traffic! Whilst the main highways are fully sealed and well maintained, many roads have gravel verges. Be mindful to keep clear of the verge, especially on corners, as this could cause a riding hazard. Some secondary isolated roads are unsealed and use gravel as the surface. In these cases, ride slowly. Note that there are some roads, which are not suitable for motorcycling. We will advise you of these at the time of pick up. During the New Zealand winter and early spring, some roads in the South Island and central North Island may be closed because of snow and ice. There will usually be an alternative route for you to take. There are also many tracks where you can experience the thrill of 'off-road' motorcycling. This seems to be unique to New Zealand, particularly the South Island and is something that our overseas visitors are quite unfamiliar with. On many highways, especially those in the more mountainous regions, you will find one-lane bridges where traffic in both directions must share the same lane. You will need to approach these bridges with care and be prepared to give way (yield) to oncoming traffic already on the bridge. At an intersection, when turning to the left you must give way to all traffic, including any oncoming traffic that is turning right. For more information, please refer to the Land Transport Safety Authority Web site. Note that for US and Canadian riders, you are not allowed to turn left on a red light. As an added thrill, you may find a couple of road/rail bridges on the West Coast of the South Island, where the train actually uses the same bridge. Trains using such bridges are infrequent. The following information will be helpful in planning your visit to New Zealand. New Zealand is in the southern hemisphere, so the seasons are the opposite to those in the northern hemisphere. Summer is December to February whilst winter is June to August. Average summer temperature is 22� Celsius (72� Fahrenheit) and winter 9� Celsius (48� Fahrenheit). New Zealand Dollars (NZ$). Current exchange rate is approximately 1USD =NZ$1.60 Please check with your bank for current exchange rates. Travellers cheques and most major international credit cards are accepted. Please Note: You MUST remove your riding helmet when entering a bank or other official/financial office, otherwise you may cause a security issue. All goods and services purchased in New Zealand are subject to 12.5% Goods and Services tax. This is usually included in the price, although some hotels and restaurants may quote prices excluding GST. Summer - December through February - usually the best weather. Autumn/Fall - March to May - fair and settled weather - the roads are quieter except for the Easter period. Winter - June to August - can be wet and cold - roads are quiet, with beautiful crisp air and scenery. Spring - September to November - weather is mixed - fresh smells and great air. Electricity is supplied throughout New Zealand at 240 volts via a slant 3 pin outlet (plugs are common with Australia). If you are coming from anywhere other than Australia, you will need a plug adaptor. These can be purchased before you come to New Zealand but are also readily available from electrical supply stores. Hotels often provide a 110 volt socket for electric shavers only. For all other equipment, an adaptor and a voltage converter are necessary. Internet Cafes are widespread throughout New Zealand. These provide email and web browsing services at very reasonable rates. Phone connections (for computer modems etc) use a 6 pin plug that is common with the UK. You will need an adaptor cable that can be purchased from computer supply stores. Most New Zealand ISP's have a global roaming agreement with major overseas ISP's. There are 2 mobile phone networks, Vodafone which operates a GSM system, and Telecom. If you have a GSM compatible phone, your phone should work in New Zealand. Telecom have roaming agreements with a number of overseas mobile networks. It is advisable that you check with your mobile phone provider before you leave. Telecom's network coverage is more extensive than Vodafone's, especially in remote areas. International Roaming cell phone calls can be expensive. To avoid a nasty surprise when you return home, it is best to check rates with your mobile phone provider before you leave. New Zealand road rules follow international standards. New Zealand drives on the left side of the road (the same as in the UK and Japan, and opposite to the USA and Europe). See Driving Tips. Averages around $1.10 cents (NZ$ and subject to change) per litre throughout New Zealand. A departure tax of approximately NZ$25 is payable by anyone (over the age of 12) departing via the three international airports. This fee can be paid by credit card and varies depending on your departure airport. Please check with your airline for current information about what restrictions apply.